The Carolina Z Club invites all Z/G/GTR's and other Nissan/Infiniti cars to Occupy Modern 6, September 16-17. We are excited to see everyone. We have changed some things compared to the previous years. This year the event will be two days and CZC sponsors will be more involved helping with the event. We are looking forward to a fun filled weekend! This years charity will also be Wags 4 Tags! 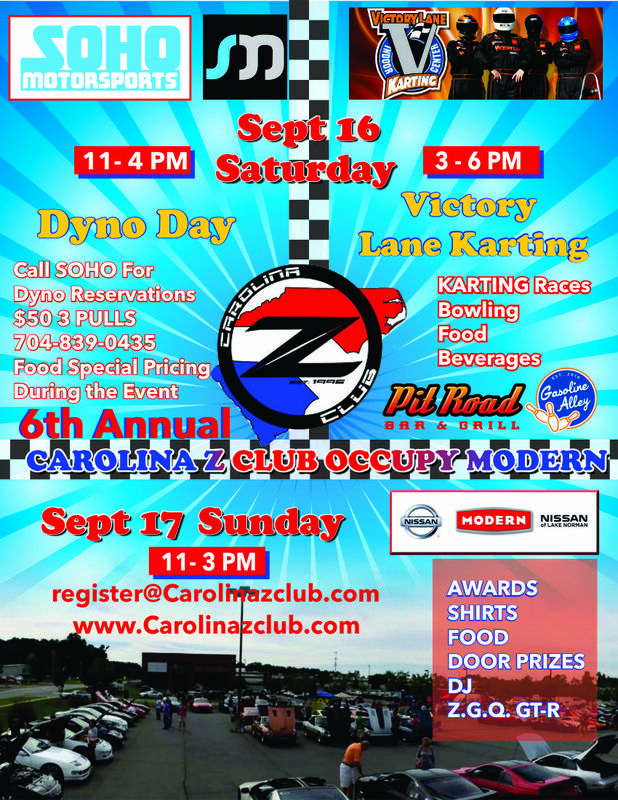 Occupy Modern 6 Events on Saturday will be at Occupy SOHO Motorsport Dyno, Victory Lane Karting/Bowling, and dinner at Mac’s Speed Shop. The Occupy Modern Car Show will be on Sunday. We have a lot of awesome activities planned for everyone. A self-service car wash is 7 minutes away from Modern Nissan for those who want to clean their cars on Saturday evening or Sunday morning before show. Please see the full Itinerary for the weekend below. We reserved hotel rooms for those that live more than an hour away and would like to stay nearby. The Hampton Inn is 2 minutes away from Modern Nissan and is generous to give us a deal on hotel rooms. We have 10 rooms with 2 beds and 5 with king beds. We can also get more rooms if needed. Check-in is September 16 and check out is the 17th. The price is $109 for Saturday night night, plus tax. The room rate is good till September 2nd. To make a reservation, call 704.892.9900 and mention the Carolina Z Club/Modern Nissan event. Here is a link Hampton Inn created for the event. (http://hamptoninn.hilton.com/en/hp/groups/personalized/C/CLTCRHX-CZC-20170916/index.jhtml ). Copy the link to search because it might not work if clicked on here. We are excited for a great time with friends, sponsors and vendors to have fun enjoying good food and amazing cars! The two-day event offers a variety of things to do for everyone. Feel free to arrive at any time. 3. Sunday MAIN event #3 - Car Show w/ awards, Food. • everyone that registers and attends will receive a custom shirt, pint glass, and a food ticket.